Now the season the has finished, it always leads me into remembering the seasons gone by; my Port yesteryears and there is one particular Port experience that comes flooding back me each time and reminds me how much things have changed and developed since my early Thai Port/Singhtarua/Port MTI/Port seasons. Things happened back then that I really can’t imagine happening these days, despite how things are now; with the ever present routine, needlessly grossly over extended international breaks. Back in the day, when God was a boy, games were almost constantly re-arranged and making plans for watching a game just a week in advanced was a leap of faith, as some games seemed to have been re-arranged 4 or 5 times. However, one of my best footballing Port memories was simply farcical and really shouldn’t have been allowed to happen if there had been even a single individual within the club structure and set-up with at least some sense of a hint of professionalism, but it does demonstrate the kind of devil may care, what the hell, attitude that was so prevalent in those heady days (in this example) of 2011. It occurred at an away day game at Samut Songkhram, a relatively small trek from Bangkok, but a nice little day out from the big city. Myself and two other Thai Port fans (Hilton and Wolfman) headed there without really having an idea of how long it would take to get there, so we got there a couple of hours before the game and there isn’t much to do there, the ground is opposite what appears to be a huge ram-shackle fish market, which sets the scene nicely for the stadium. It’s a ‘rustic’ Athletics stadium with one concrete stand and had a feel that even when it had just been built it probably looked like it was visibly deteriorating. We were able to get really close to the running track to the side of the stand and gazed out in wonder and admiration over the pitch and the stadia and breathed in deeply the atmosphere and the ambiance of the place. Then we noticed some tubby looking Thai guys dressed in Thai Port polo shirts chatting on the other side of the fence. One of us (Wolfman) was able to communicate in Thai, and we found out that they were part of the Thai Port coaching staff, (I want to say one of them was a Fitness Coach but that didn’t seem believable) they came over and chatted with us (well, with the one of us who could speak Thai anyway), they chatted very openly and in an amazingly relaxed manner, for the training staff of a team about to play a Premier league match. In fact, they invited us over the fence and offered us the opportunity to hang out (and I feel slightly uncomfortable using an Americanism, like hang out, I apologize profusely) in the dugout with them and some of the substitutes. Not a single steward or Samut Songkhram official was to be seen to obstruct us. It was very odd and also very amazing and not something that I could ever imagine happening, even at (my lowly and beloved) Aldershot Town level football. Substitutes and players came and went, we mingled, I’d like to say we chatted but that wouldn’t be strictly true (and not that convincing either, so I won’t). We sat on the seats in the dugout, with not quite the comfort level of the seats of Old Trafford or even Thunder castle, but it was still magical. One of our group (Hilton) had a Port shirt and asked one of the players we were hanging out with (sorry there’s that phrase again) (I think it was Wisarut, a fullback who joined the club in the mid-season break and then left at the end of the season) if he would mind signing the shirt and he very, very generously offered to take the shirt back into the changing room to get other signatures for him. He came back with well over 10 signatures, which was a stellar effort. We continued to sight-see on the bench and enjoyed the perplexed looks of the Samut SongKhram fans in the stand behind, clearly wondering who the hell these 3 (deeply unprofessional looking) white guys were in the Thai Port bench area, the amount of serious, aimless pointing and gesturing we did to try and look important and significant was possibly embarrassing but irresistible. We also witnessed the then Thai Port manager Thongchai chatting on his mobile phone on the pitch which just appeared really strange to see the team manager seemingly so uninvolved in the preparation before the match, he seemed less approachable than the rest of the set-up and barely gave us a second look, which again seemed something that wouldn’t happen in a more organized setup. Professionalism didn’t seem to be a watchword of anyone involved. But possibly one of the weirdest parts was that at no point did anyone tell us to leave, I’m pretty sure that if game time had come around we could possibly, have blagged it and stayed in the bench area for the whole game, such was the Thai embarrassment in causing a scene, no one said anything about us getting the hell out of there and letting them get on with preparing for the match. So being the true Brits that we were (and possibly still are), our sense of politeness and social awkwardness got the better of us and we voluntarily left the area and made our way round the ground to where the rest of the Thai Port fans were, to stand on possibly the worst cobbled together, rickety, insecure, balsa-wood, ice-lolly stick stand I had ever been on. 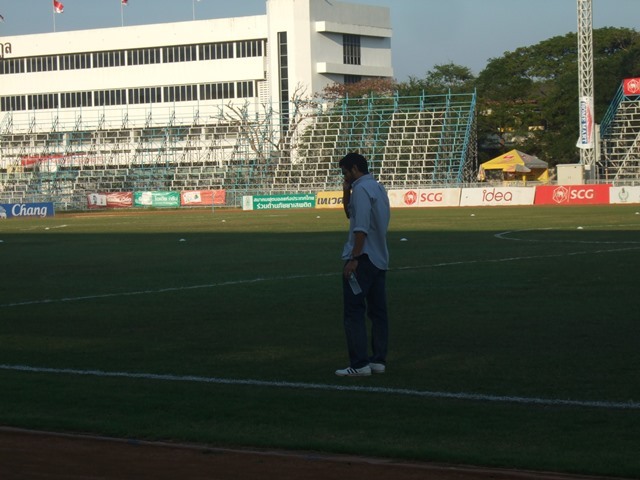 Until of course I experienced the away stand at Sri Racha’s stadium a couple of weeks later. We lost the game 2-0 and sadly Moise (God I miss him, so much) was red-carded, it was a deeply forgettable game and I can only thank God that we didn’t score because if the Thai Port fans had had any reason to celebrate at all, that stand may not have stood up to the task. Although I did see Thai Port and Singhtarua beat Samut Songkhram in 2012 and 2014 and the stands were still standing each time, so maybe its significantly stronger than it appears. But that experience of being invited to hang out (oh God, there it is again) in the bench area and meet players was so surreal, Wonderful disorganization and lacking structure, couldn’t be any better or more Thai really! P.S. Apologies to Wolfman as he is actually from New Zealand and not Britain.